Two children were attacked by what animal services describe as a PIT BULL MIX, right in their front yard. 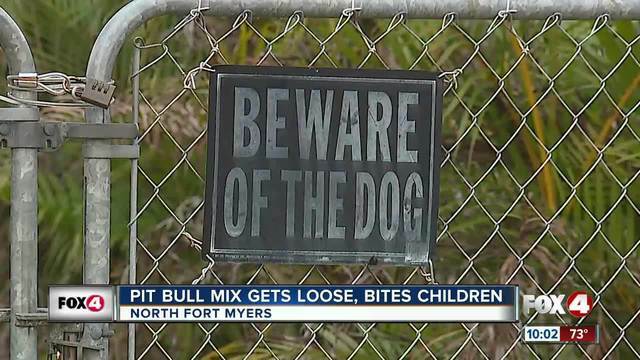 Lee County Animal Services say, a dog exited the front door of its home, crossed St. Clair Avenue in North Fort Myers and bit two kids this past Saturday evening. "I'm an animal lover, but children come first," said Kevin Goodwin, a dog owner and who walks his dog near where the attack happened. Animal services snapped pictures of one of the children with a bite mark along the arm. The other child had one on the leg below the diaper. "To see a child maimed that way by an animal is very disturbing," said Goodwin. According to the report, the Lee County Domestic Animal Services agent informed the owners their dog will be placed in a 10 day quarantine. The owners informed the investigator about the dog's previous aggressive behavior. In the report, the woman tells the agent the dog has bitten her own child. "If the dog has a history of attacking and coming off the property, it should've been picked up," said Goodwin. The animal services report says the owners want to surrender their dog once the quarantine expires. Neighbors hope this means they won't have to worry about their children. "Everybody should be able to feel safe when they're walking the sidewalk around their property without being attacked by a stray animal," said Goodwin. "The other child had one on the leg below the diaper." So, the pit bull bit a baby? But I thought they were nanny dogs?